Using google will find 2 sites hosting this version of the Kodak publication. Don’t bother with it if you are serious about learning the process as it was practices at its height. The publication isn’t so much wrong in error, but is by omission. Massive omission. When I was shown a printout of it, I thought there must be pages missing, since it seemed to end abruptly. After further checking, confirming the contents etc.. it was a complete printout- so I read it. Doing. No one, even if they had in date supplies, would meet with success at re-creating the lost procedures that were once the dye transfer process. There are no in date supplies for sale. There are, to my knowledge, less than 10 people working with current date materials. Of course, there are several working with out of date supplies. Matrix film made by Kodak, Efke, DTC. Most of these people can be found on the yahoo group hosted by Jim Browning. If you want to browse the group, I’d suggest going to the original posts, collecting what materials will be immediately useful. Stop when you enter the 2005-06 frame. The more recent stuff is of little significance. Dye Transfer International (see link) offers printing. As I understand, they have their emulsion made custom. They also have paper and dyes customized for their current procedures which are based upon exposing to laser. Bettina Haneke is the principal contact at DTI. No other printing services need new clients. Those people printing are printing with out dated materials, and print, essentially reprint, for existing portfolios. James Browning (see link) may be able to print for you. I’m listing him more so you can track him down yourself. 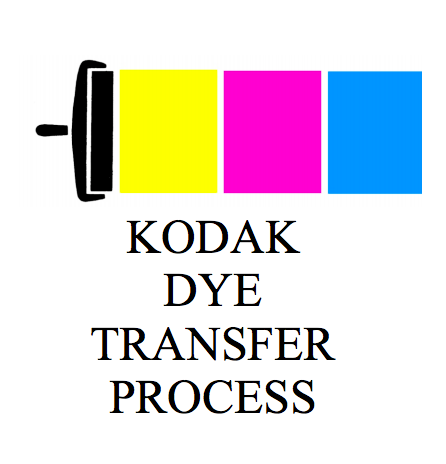 If you go to the link, you will be able to download a better set of instructions for making dye transfer than the Kodak E-80. means learning a new material and supply set. It also means that you are one of a very small group having access to those new emulsions. Learning to use, now, means learning to make, or how to form buying groups.